After spending the summer working in BIOS labs on a variety of research projects, the 2012 interns have headed back to their respective universities to continue their studies. Before they left, some of the interns took a moment to talk with us about their experiences. Read on to learn what a typical day is like in the life of a summer intern, as well as some memorable moments and what the interns feel they gained from their time at BIOS. I worked with the BEACON Lab and would help out with daily duties (including YSI water measurements), weekly duties (cleaning the tanks and tubing and collecting water samples), and then weighing the corals on a monthly basis. Later in the internship I was able to help a PhD student who was looking at the carbonate chemistry in a mesocosm experiment, as well as in the field. 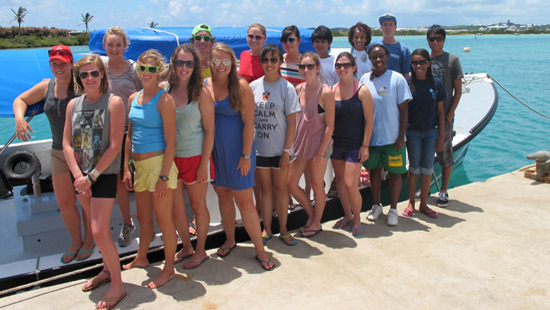 My most memorable experience was taking the Coral Reef Ecology course, as I met a lot of amazing people and learned a lot of interesting information about coral reefs. I was also able to do a lot of diving at various spots around Bermuda. The hands-on experiences in the field and in the lab during that course are skills that will stick with me throughout my career. The scientists and people that I met who work at BIOS have made my experience here one that I will remember. Networking and meeting stationed scientists, as well as international visiting scientists, have been a great part of my experience here. The intern presentations every week allowed me to understand what other research is being done at BIOS. My project aimed to measure copper toxicity in the ocean sediment, and to assess its toxicity to diatom populations by conducting incubation experiments. My project was split into two parts, so for the first half I was primarily analyzing collected sediment samples for copper levels all day. For the second half of my project I was working with incubations of phytoplankton, so in the mornings I would filter and collect samples from incubation bottles and in the afternoon I would analyze these samples for such things as chlorophyll levels and bacterial counts. It was great meeting so many new and awesome people with diverse backgrounds. It was also valuable learning and understanding the ups and downs that come with scientific research. There are so many unexpected problems/developments that come with any research and it was good to see and learn how to deal with and manage these difficulties. For my project, I wanted to study the dynamics of damselfish social networks and how it relates to information transfer. Every day I would go out to Whalebone Bay during low tide with another intern and we would monitor damselfish and record their social interactions on an underwater slate. During the second part of my research we spent a significant amount of time in the water (anywhere from ten minutes to two hours) trying to catch beaugregories (damselfish) for the containment aquarium experiments on territory preference. My most memorable experience was when I was trying to catch a damselfish. I was underwater watching the fish to see which rocks it preferred to hide under and, when I looked up to swim to the surface, I realized there was a juvenile barracuda right next to me! He was only about a foot and a half long, but his mouth was open and he was staring at me curiously. I remember just hoping that he would swim away and not notice the shiny silver watch on my left hand. The most valuable thing I’ve gained from my time at BIOS is the experience of having done fieldwork. I am now able to inject 2” fish with tags just below the surface of their skin. And if anyone needs to catch live damselfish and only has two nets, I’m your girl! I studied the effects of ocean acidification on coral recruits from rim and patch reeds. An average day in the lab during spawning times would be to collect larvae for two hours, settle the larvae onto tiles for two hours, check for old larvae settlement, and sample aquaria for a variety of checks (pH, pCO2 concentration, salinity, etc.) depending on the day. In the field, a dive trip would be either to Bailey’s Bay or North Rock to collect or return colors. My most memorable experience was collecting Porites (coral) out at North Rock. The visibility was perfect, our team’s communication was flawless, and I got to work in one of the most beautiful settings in the world. The most valuable thing I’ve learned is how much work research scientists put into their projects. Not that I didn’t think research required work before I came here, but living the lifestyle was truly invaluable to understanding that research itself is a lifestyle and not just a day job. My project was “Open Ocean Atmospheric Deposition of CDOM” and used lignin, a polymer found in wood, as a tracer for terrestrial organic matter in the open ocean air and water. We found strong evidence, for the first time, that atmospheric deposition is a significant source of these photoactive organic chemicals. There was a lot of variability in my “typical day” – I spent two weeks aboard the R/V Atlantic Explorer, time at the atmospheric field sites, and I also did a variety of experiments. Aboard the AE I would spend a lot of time keeping track of the winds for the atmospheric portion of my project, as well as taking water samples from various depths with the CTD for the oceanic portion. On land I spent several mornings taking high volume air samples to see what chemicals (if any) the incinerator is putting into the air. The rest of my project was lab work – using gas chromatography and a mass spectrum analyzer to detect tiny amounts of various chemicals. My most memorable experience was working on the AE. The two cruises I took this summer were my first two times being at sea and it was a lot of fun! The people aboard the AE are great, the food is phenomenal, and the views are otherworldly. I think the experience in field work and very careful analytical chemistry will be extremely valuable as I go forward and do other work in chemistry. I learned a lot of new techniques and a lot about how to think about problems in analytical chemistry. My project, titled “Applications of Coral Bio-Optics to Coral Reef Management,” was about developing a new tool—a diver-operated spectrometer—into a method of reef monitoring. An average day was usually spent in the water, diving on a reef using the spectrometer on the corals and helping the lab do reef surveys, or sitting somewhere quiet and working on my master’s thesis. It was a good balance of work and “play” and I have so many great memories from diving and interacting with my lab mates and fellow interns. The most valuable thing I’ve gained is definitely research experience. This is the first time I had worked at a research station on my own research and my own individual project, as well as contributing to the overall work of the lab.